We have been living in Munich since 2012 and have visited Oktoberfest many times each year so we wanted to give you some tips, a bit of background knowledge and information about Oktoberfest that we have learnt since being here. 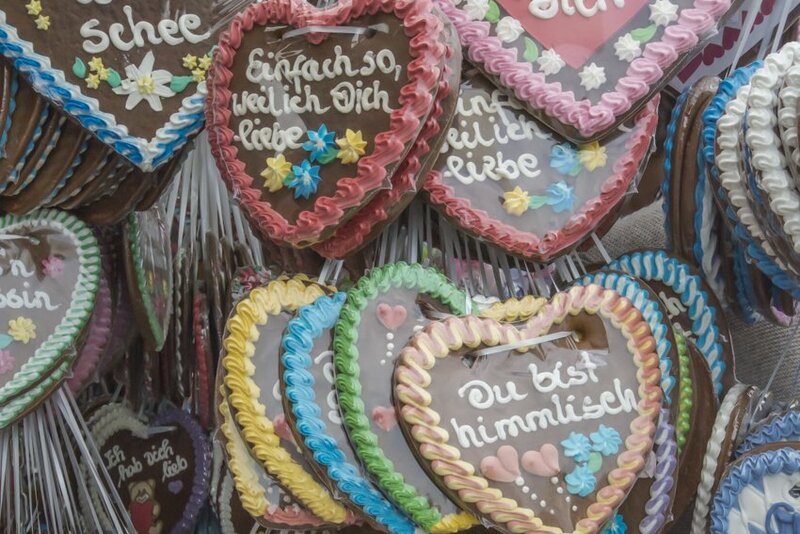 Oktoberfest is so much more than drinking copious amounts of beer, though for some (particularly tourists) that is all Oktoberfest is about. 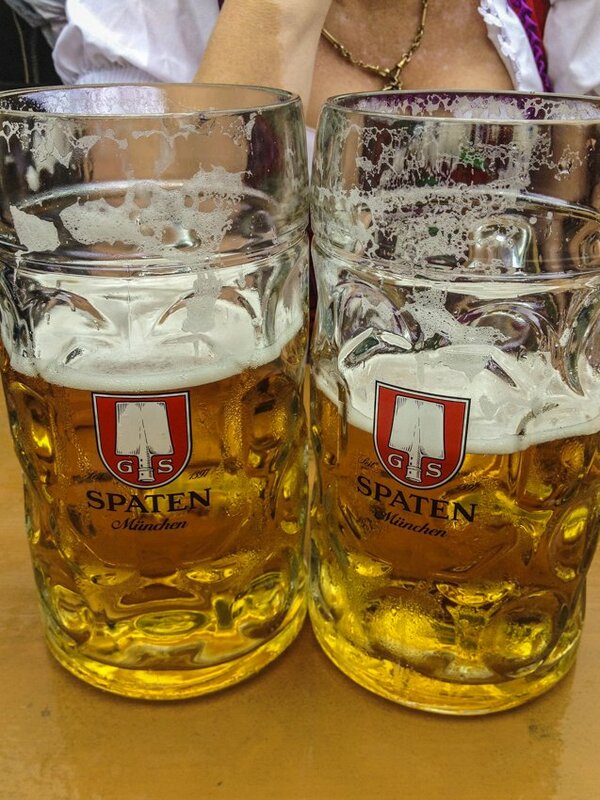 Oktoberfest has a long-standing history in Bavaria (a southern state of Germany) dating back to 1810. 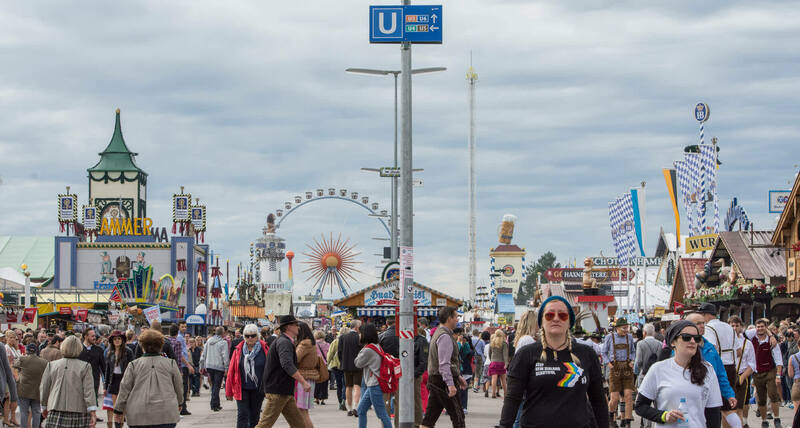 It was originally a big party for the people (volksfest) to celebrate the marriage of Crown Prince Ludwig and Princess Therese, hence the name of where Oktoberfest takes place, Theresienwiese (Therese’s meadow) known to locals as the Wiesn. It is probably the single biggest tourist attraction in Munich. The population of the city can more than quadruple over two and half weeks. It is held during the last two weeks of September starting on 19th September 2015 and on 17th September 2016 until the first Sunday of October (4th October 2015 and 3rd October 2016). “Why is it called Oktoberfest then?” I hear you ask. Well, it was originally in October but due to weather becoming pretty crappy pretty quickly in October they moved it forward to ensure some decent weather. The first week is traditionally known as “Australian week” and the second weekend is known as “Italian weekend”. So many Italians attend that the Italian police come and help the German authorities keep those rowdy Italians under control ;). It should be pointed out that Oktoberfest is not a German tradition but a Bavarian celebration, however, other states in Germany have their own volksfest. This also means that the traditional dress of lederhosen for men and dirndls for women, trachten, is also unique to Bavaria. Trachten is not a costume only worn to Oktoberfest and Halloween parties. 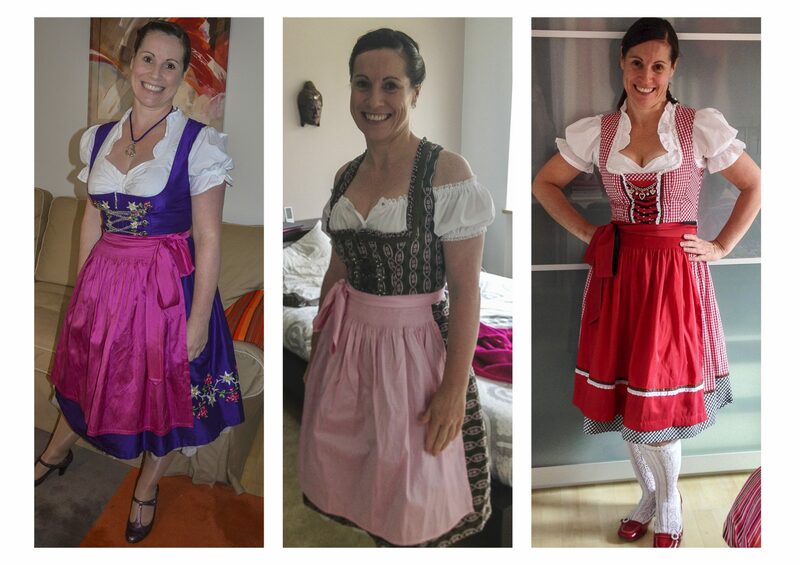 For a true Bavarian it is worn to all special celebrations, including weddings. I love wearing my dirndls, yes I have more than one :), it is an extremely feminine dress that suits every shape and size and is somehow fun to wear. As Oktoberfest has become more commercialised so have the outfits that they sell. You can even buy lederhosen for women but I prefer the pretty dresses in every colour imaginable. Lets talk about the beer seeing as this is the main focus for many visitors. 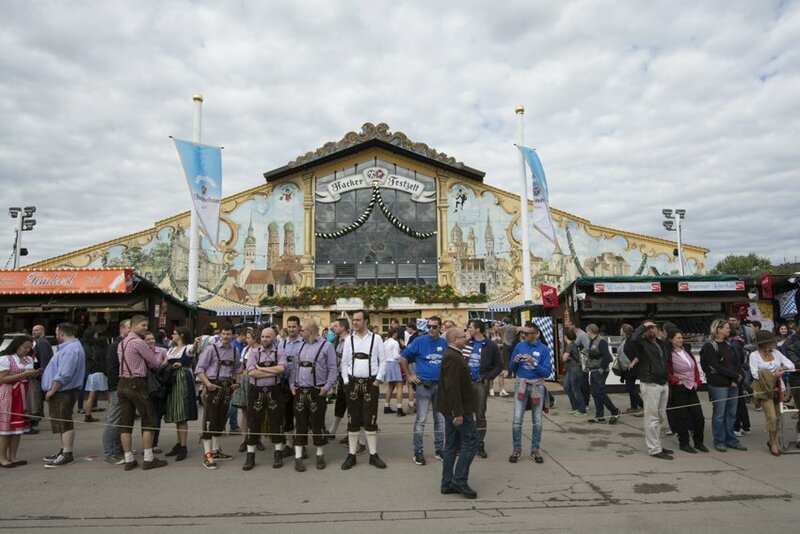 There are six Munich breweries that are at Oktoberfest every year. These include Augustiner (the oldest Munich brewery), Hacker Pschorr, Hofbräu, Löwenbräu, Paulaner and Spaten. The beer is a little different to other beers in Germany and world-wide for that matter as the beer has to be brewed according to strict regulations. The mistake many people make at Oktoberfest is that they forget that the beer is stronger than most standard beers, hence things can get messy very quickly. 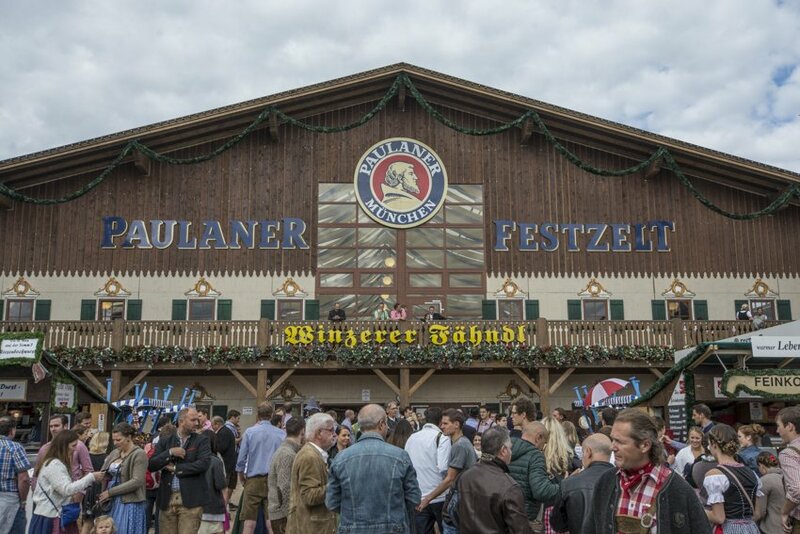 Secondly, you can only buy beer in the big tents by the litre, called ein Maß (often known as a stein in the English-speaking world but no-one calls it this way in Germany!). There are many tents (zelte) at Oktoberfest, not only the big name beer tents. 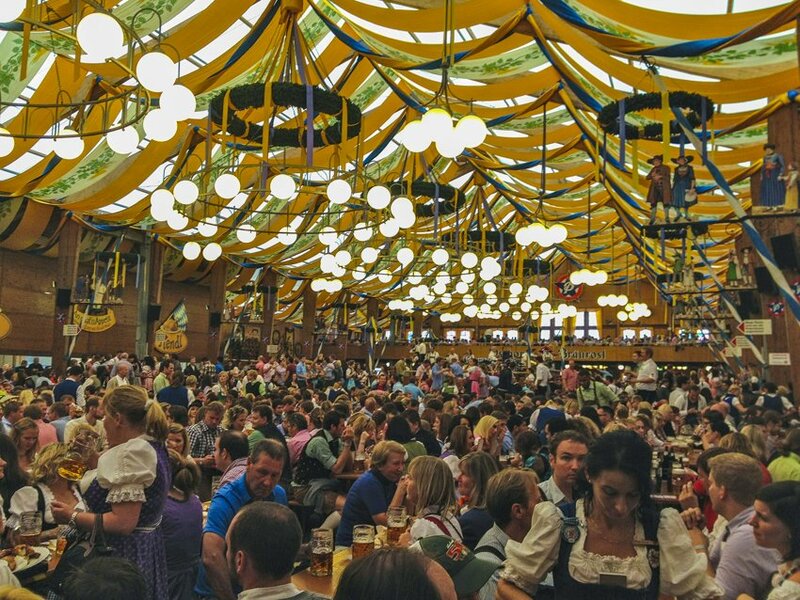 There are loads of food tents, most of which serve traditional Bavarian food as well as beer. 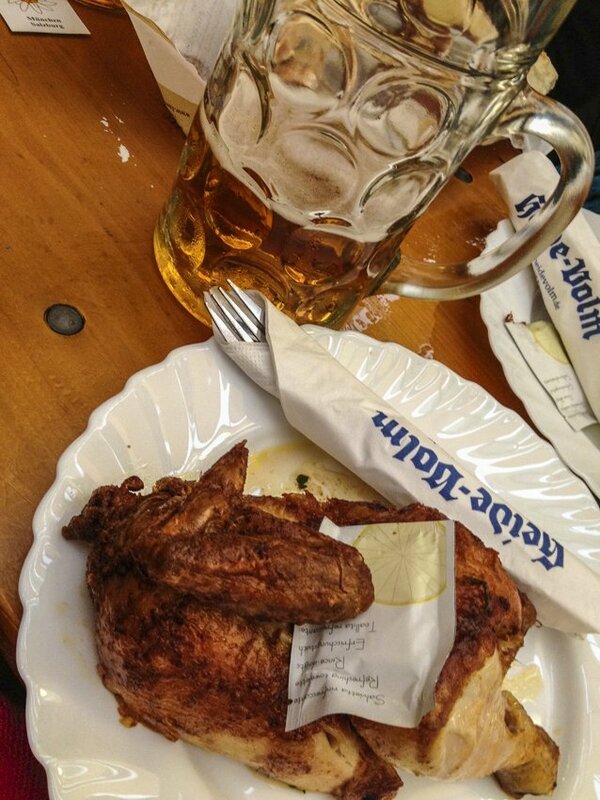 Within the beer tents you can also purchase food, schweinhaxe (pork knuckles) and halbes hendl (half a bbq chicken) are favourites, as well as a good old brezn (a large bread pretzel). I can also recommend some Obatzda to have with your brezn which usually has the main ingredients of camembert, cream cheese and paprika (totally not for the diet conscious). If beer is not your thing there is also a wine tent called Weinzelt (wine tent, German is a very logical language). 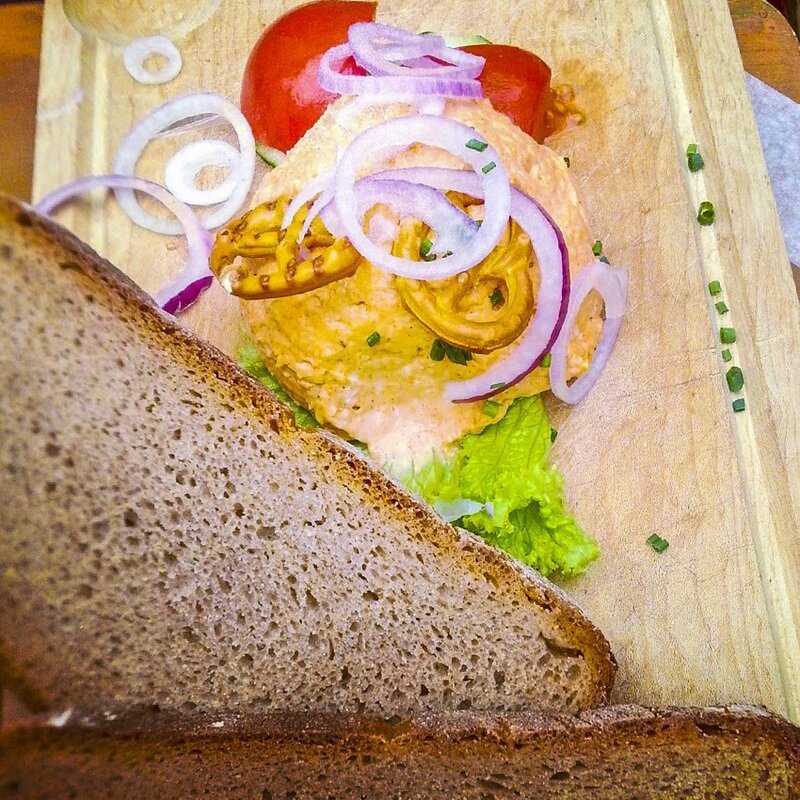 Oktoberfest is not only about drinking alcohol, ok maybe it is. But it can be quite a family oriented affair too. There are loads of rides for big and little kids as well as some fair games. This year we are going to attempt to visit the Oide Wiesn (the old wiesn, it is meant to be more traditional and also more family oriented). I hear it is meant to have more of a historical character than the rest of the Wiesn. 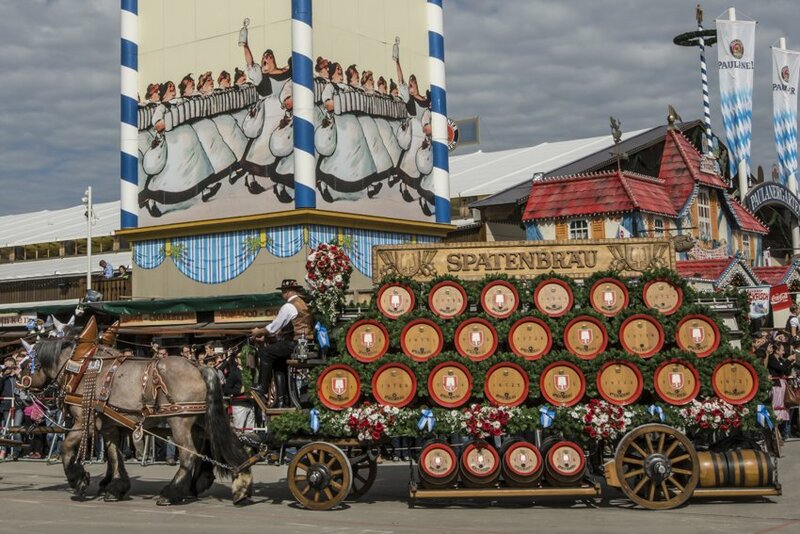 The first weekend of Oktoberfest draws a big crowd as they have a huge parade of horse-drawn carts from the breweries and the landlords through the city which finishes at the Wiesn and then the first barrel of beer is tapped by the mayor of Munich, only then can Oktoberfest begin! On the first Sunday there is also the Costume and Riflemen’s parade. 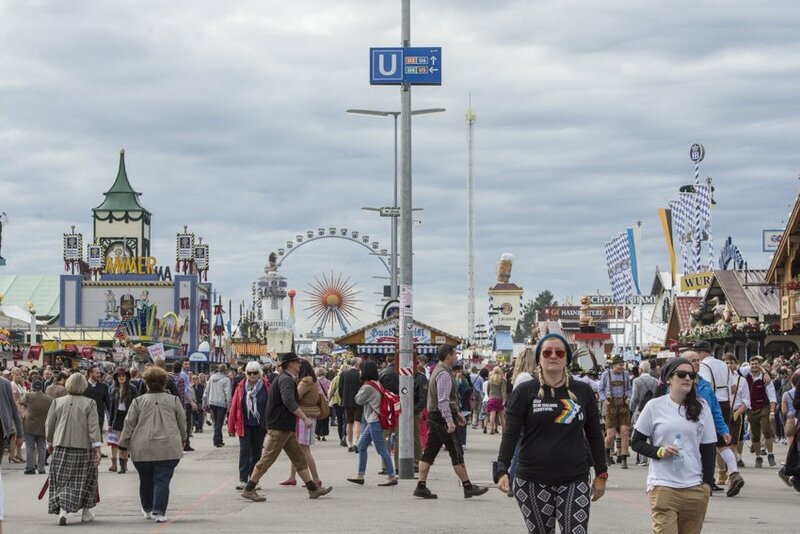 You do not have to pay to access Oktoberfest, you pay as you go for food, drinks and rides. My advice would be go early to get into a tent (weekdays can be easier) and even then you are not guaranteed a table. You can book tables but be aware that this is quite hard to do, most tables are booked a year in advance by long-standing customers. It is much harder to get into a tent in large groups. Löwenbräu, Augustiner and Hofbräu are probably the most popular, don’t be afraid to try a tent that is not as “famous” (though in Bavaria all of the breweries are well-known). It is not cheap but then again a Maß is a litre of beer, compared to some countries, paying just over €10 is a bargain! Expect food in the tents to be of a similar price. Always tip the waiters that bring you your beer and food! They work hard and have to put up with a lot of crap over the two and half weeks of Oktoberfest. To round up to nearest whole euro is quite acceptable. All in all, Oktoberfest is a lot of fun, especially with a group of friends. You meet some interesting characters from all over the world. For example, a friend came to visit during Oktoberfest and we ended up sharing a table with four big, hairy Norwegian guys who provided us with hours of entertainment. However, do ensure you stay safe and stick together as things can very quickly go wrong at an event where people have been drinking beer all day. One last tip, book accommodation early as the hotels fill up fast. Have you been to Oktoberfest? Do have any Oktoberfest tips? Do you have any questions about Oktoberfest? Just hit the ‘Leave a Comment’ link at the top of the page and let us know! 5 Comments on “It’s Oktoberfest time again! More than just beer and partying.”. Join the Conversation Here! Let the party begin then! Oktoberfest is not gluten-intolerant friendly but hey, what would I not do to go along with you in a Dirndl! And the boys in their Lederhosen! David said you two need to get your butts here next weekend. We have room at our place. He also needs to be careful with the gluten free thing, you can find an option together. I have a dirndl for you to wear ?. Argh! My brother is coming up our mountain next weekend! When does it all end again? Must plan a trip this year or next!